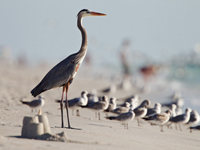 You will see wading and water birds all over southwest Florida’s shorelines and estuarine regions. Getting to know the habits of our winged neighbors can be a delight. And learning how we can better interact to preserve our shared environment is a long term benefit for all. Remember that many shorebirds nest along the beach, so be respectful of nests and avoid disturbing birds. Herons and egrets are in the same family and differ mostly in color and size, with egrets generally smaller. Unlike the ibis, storks, and spoonbills, that fly with their long necks extended, herons fly with their necks retracted. 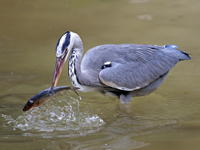 The Great Blue heron is a huge and handsome wading bird, about five feet tall, with a steel blue-grey color. There is a patch of black on the top of its head and its throat. Its bill and legs are yellow. They wait patiently for a fish or small crustacean to go by and then spear it with their long, pointed beak. They feed in fresh or salt water and are often seen around the shoreline, marshes, or wetlands, with a typical range throughout North America and from Florida south through Mexico and the Caribbean into South America. Great Blue herons make their nests from sticks and roost in colonies in the trees near water. The females generally lay 3-5 two to three inch long blue eggs that hatch at two day intervals. Little Blue heron adults are grey like the larger cousin, though a deeper color, but have a red neck and green legs. The young, however, are white. The Great egret is a large bird like the Great Blue heron, but it is white-feathered with black legs and a yellow-orange beak. The Snowy Egret has a showy white plumage that was once prized for high-fashion hats, an “asset” that nearly drove it to extinction. Its head, neck, and tail are white, its legs are black with the most striking pair of bright yellow feet and its bill is black and pointed for spearing, with a yellow patch at the base of the beak. Snowy Egrets are common around fishing piers and can become rather tame. 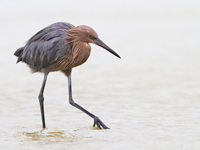 This wading bird feeds with quick sprints through the water to stir up fish and lightning jabs to grasp its meal. This large, ostentatious bird was nearly extinct around 1940, having been hunted for their rose colored feathers which, like the Snowy Egret, adorned women’s hats. True to its name, the feathers are various shades of rose, it stands on red legs, and has a long beak that ends with a spoon used to scoop up minnows and shrimp from the shallows. They are 2.5-3’ long with a wingspan of about 4 feet. You’ve probably seen them as an ornament on Florida lawns with their pink color and black beak and legs. 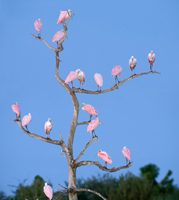 These 3-5’ tall pink birds are stunning to see in flocks wading in the shallows and posing on one leg. Their black beak has a unique scoop to siphon mud to feed on shellfish. The ibis has a very distinct long beak that hooks around, allowing it to capture a diverse diet of small creatures such as snakes, fish, crabs, frogs, and insects from the mud. The White ibis has black tips at the ends of its wings, red legs and a red beak. The Sandhill Crane and limpkin are long legged, somewhat large birds that look like wading birds, but actually frequent the drier areas. There is a variety of these water birds, but the Purple Gallinule is the most striking with its deep purple-blue iridescent feathers, red beak, and yellow feet. You’ll often see them walking on lily-pads or mats of water plants. Everglades National Park is a common viewing site. The Brown pelican is a “back from the brink of extinction” species, which has made a stunning recovery from pesticide pollution of DDT, which thinned the shells of many birds’ eggs. Pelicans are bulky birds, nearly four feet long with an almost six foot wingspan. These giant fish eaters will be hanging around docks hoping to get the scraps from fisherman or diving in for their own catch. This relationship can put them at greater risk of swallowing a hook or getting tangled in fishing line. In flight they look quite elegant, gliding along on wind currents near the shoreline, flapping their wings slowly and infrequently until they plunge into the water. They dive straight down and stun fish in the school when they hit the surface. They have a distinctive yellow “pouch” under their neck for scooping up fish, along with about two gallons of seawater, which they drain after the dive and scoop maneuver. Adults are brown with white necks and a yellow patch on front and top of their head. They brood once per year and lay 2-4 eggs, which they keep warm with their big webbed feet. 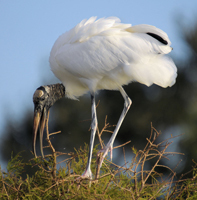 The Wood Stork is a large wading bird and is the only species of stork to nest in Florida. The largest nesting colonies in the U.S. can be found in southwest Florida’s Corkscrew Swamp Sanctuary, where they can feed in the shallow ponds by wading through the water with mouth agape until the touch of a small fish causes a snapping reaction. These birds are commonly seen in rivers, bays, and salt marshes, or any estuarine environments. This tern is the only bird in the world whose lower beak mandible is longer than the upper, allowing it to “skim” the water for fish. Their very unusual vertical pupils helps to reduce glare from the water and white sand as they are skimming close to the surface when looking for fish. You can recognize them by their red and black pointed beak, red legs, black pointed wings and cap, and white body. They are about 18 inched long. As with other shorebirds that leave their eggs among the rocks and shells in the sand, there is a danger of disturbance by humans, dogs and small animals like raccoons. Both males and females incubate the 3-7 camouflaged tan or blue speckled eggs that are placed in the shallow nest “depression”, or scrape. Obviously, if the adults are disturbed while nesting, the eggs are left vulnerable. Both are diving water birds that, though not related, look very much alike. Anhingas have a pointed beak and cormorants have a curved beak. The sleek feathers are a deep black color, but Cormorants do not have waterproof feathers and you can often see them standing atop posts with wings outstretched for drying. Leave standing snags (tall, dead trees with branches gone and limbs remaining). Build Kestrel boxes and bird houses. Plant native flora. Provide feeders and fresh water during scarcity or drought. Put a collar with a bell on outdoor cats so the birds get a warning of danger. Never disturb nesting birds. 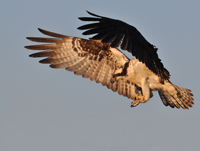 Avoid pesticides, ESPECIALLY rodenticides, which pass from the rodent to the bird of prey and cause internal bleeding. Support conservation groups. 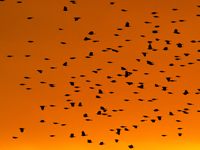 To be sure you are following “best practices” in your bird watching outings, check out the American Birding Association’s Code of Ethics. Then grab the binoculars and head out. 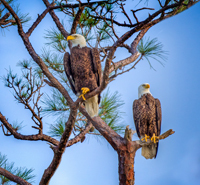 You’ll be awed by the variety and displays of Florida’s birds.